Michael Cooper, an activist for Israeli-Palestinian peace and author of the award-winning history-adventure novel “Foxes in the Vineyard,” will donate all proceeds from book sales to the Palestine Children’s Relief Fund during an April 18 fundraiser in Haifa, Israel. Cooper is scheduled to speak at the event, sponsored by The Mossawa Center, the non-profit advocacy center for Palestinian Arab citizens in Israel. Established in 1997, it promotes the economic, social, cultural and political rights of Palestinian Arab citizens in Israel. “Israeli-Palestinian peace has, for the most part, seemed more and more out of reach almost since Israel’s creation in 1948,” says Cooper, a Jewish American who lived and studied in Israel for 11 years after high school. As a pediatric cardiologist, he regularly visits Israeli-occupied territories in the West Bank to provide medical care for the underserved children there. “The problem is that extremists on both sides prevent Israeli-Palestinian peace and have managed to perpetuate a decades-long occupation that hurts the majority of citizens on both sides who want to live in peace,” says Cooper, whose allegorical adventure novel examines the ultra-nationalism, religious mysticism and intolerance that permeate the Israeli-Palestine conflict. All proceeds from book sales at the event will be donated to the Palestine Children's Relief Fund earmarked for the first and only Pediatric Cancer Center in the West Bank – the Huda al-Masri Paediatric Oncology Department at Al Hussein Hospital in Beit Jala, http://www.pcrf.net/projects/ped-cancer-department/. “Foxes in the Vineyard,” an Indie Publishing grand prize-winning novel, is set in Israel in 1948 and includes both historical and fictional characters. It explores Israeli-Palestinian peace and the formation of the Jewish state through fast-paced adventure layered with intrigue. “Michael Cooper manages a tour de force, creating a composition of Jerusalem, Contemporary and Historical, Earthly and Celestial, Good and Evil, all brought together with an intricate plot that leaves the reader guessing to the last minute. The book is well researched and Jerusalem comes to life through his beautiful prose. A winner.,.” writes Amazon reviewer Eylon Meroz, who gave the book five stars. Michael J. Cooper emigrated to Israel after graduating high school in Oakland, California. Living in Israel for more than a decade, he studied at Hebrew University in Jerusalem and graduated from Tel Aviv University Medical School. Now a clinical professor at the University of California San Francisco Medical Center and a practicing pediatric cardiologist in Northern California, he returns to Israel several times a year, volunteering on medical missions under the auspices of the Palestine Children’s Relief Fund. 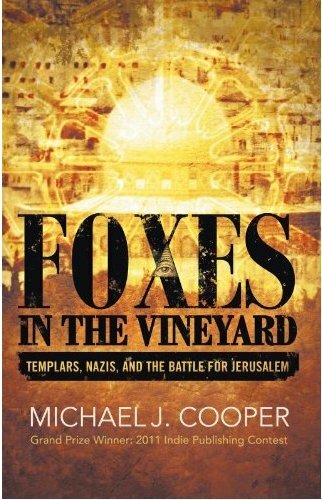 Cooper’s novel, “Foxes in the Vineyard,” historical fiction set in 1948 Israel, was the 2011 grand prize winner of the Indie Publishing Contest. A second novel, "The Rabbi’s Knight," is due out soon.